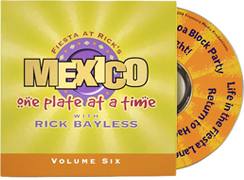 Mexico–One Plate at a Time with Rick Bayless, brings to life the foods, the flavors, the stories and the fun of Mexico to create a whole new kind of cooking show that mirrors the thrilling diversity and depth of Mexico. Each DVD includes a selection of the best episodes from that season. Yucatán: A Different Mexico For the 11th season of Chef Rick Bayless’ highly-rated cooking and travel show, we’re taking our viewers on a journey through a different Mexico, to the Yucatàn Peninsula. The Whole Enchilada! The first season! Featured episodes include: Ceviche in the Limelight, Holy Mole, Three Hot Tamales and Pozole. Keeping the Flame! Volume Two sampler serves up five episodes including: Fish a la Veracruzana, Mojo and Excabeche, Let’s Talk Tacos, Sopes & Gorditas and Straight Cheese on Quesadillas. Tropical Cool! Volume Three sampler serves up five episodes including: Antojito Jones, Tropical Cool, Chorizo Hunter, Color on the Palate and Savoring Sundays. Fusion Revolution! Volume Four sampler serves up six episodes including: Super-Hero Sandwich, Quest For Fire, It’s A Shore Thing, Welcome to Tequila, Fusion Revolution and Mexico Unplugged. Modern Mayan! Volume Five sampler serves up six episodes including: Mysteries of the Deep, Savoring Citrus, Tropical Sweet Tooth, Hacienda Renaissance, A Pig, a Pit, and a Plan, and Two Chefs at Playa. Fiesta at Rick’s! Volume Six sampler serves up six episodes including: A Man, A Pan, Paella!, Return to Hacienda, Seafood Cocktail Party, Barbacoa Block Party, Life in the Fiesta Lane, Street Fare Tonight! Mexico City Live! Volume Seven sampler serves up five episodes of action, adventure and incredible food from one of the world’s great cities. Astonishing Baja! Astonishing Baja! Volume Eight sampler serves up five episodes of action, adventure and, of course, the amazing comfort fare that have become Bayless trademarks. SOLD OUT! Only in Oaxaca! For the ninth season of Chef Rick Bayless’ highly-rated cooking and travel show, Rick takes us from Oaxaca City to Puerto Escondido to explore the cuisine and culture that makes Oaxaca so irresistible. 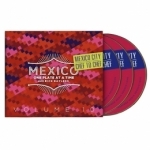 Mexico City: Chef to Chef For our tenth season, Chef Rick Bayless returns to Mexico City and joins the region’s passionate new chefs to explore a vibrant restaurant scene, evolving cuisine and ancient culture.